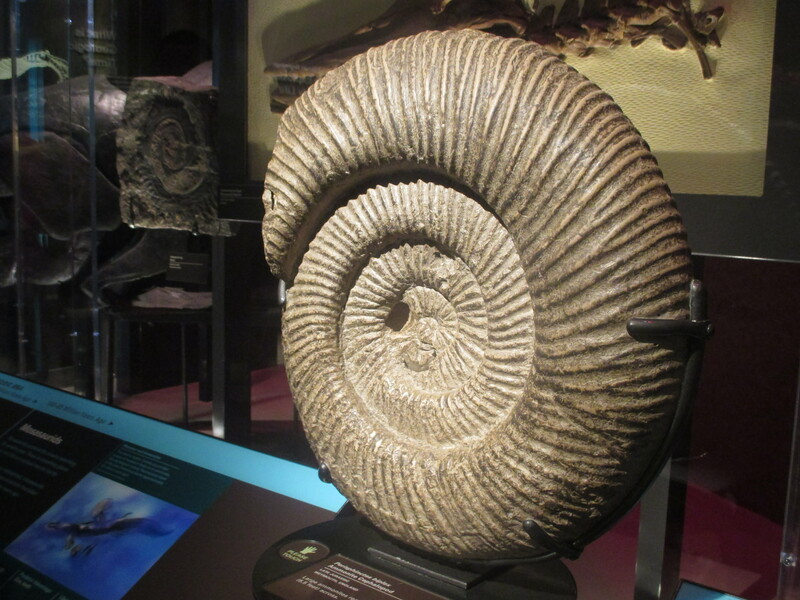 Day Three: Our first stop at Washington’s Museum of Natural History has been booked well in advance. 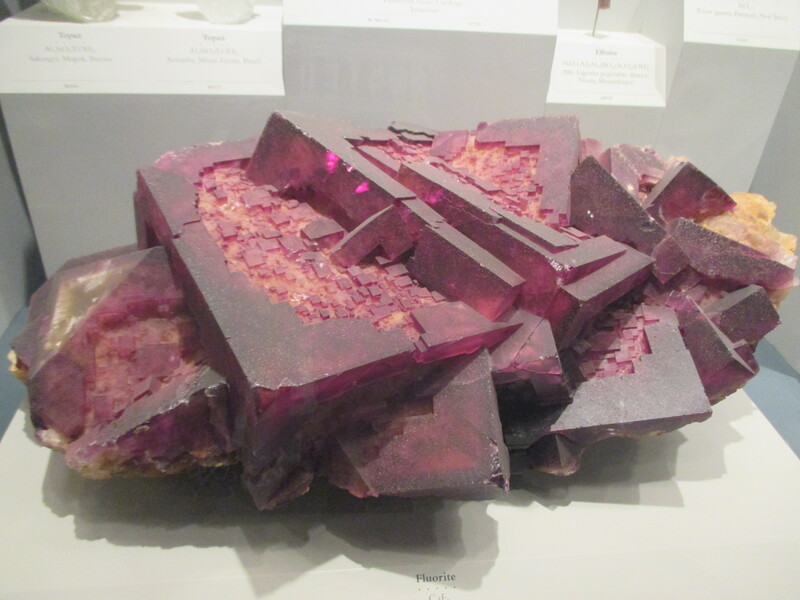 Not far behind my mum’s wish to take her kids to Disneyland has been her visit to the Gems and Minerals section of this museum, and in particular, the chance to see the Hope Diamond. This branch of the Smithsonian Institution is the size of 18 football fields and houses over 1000 employees, but this stone the size of a pigeon’s egg is arguably the Museum’s premier exhibit. The Hope Diamond, valued at US$200 – US$250 million! In the mid-17th century, French gem merchant Jean-Baptiste Tavernier brought from India to Paris a large uncut diamond, which by the end of the century was sold to King Louis XIV of France. The stone was then cut and passed through the French royal family until 1792 when during the French Revolution it was stolen as part of a theft of the royal crown jewels. 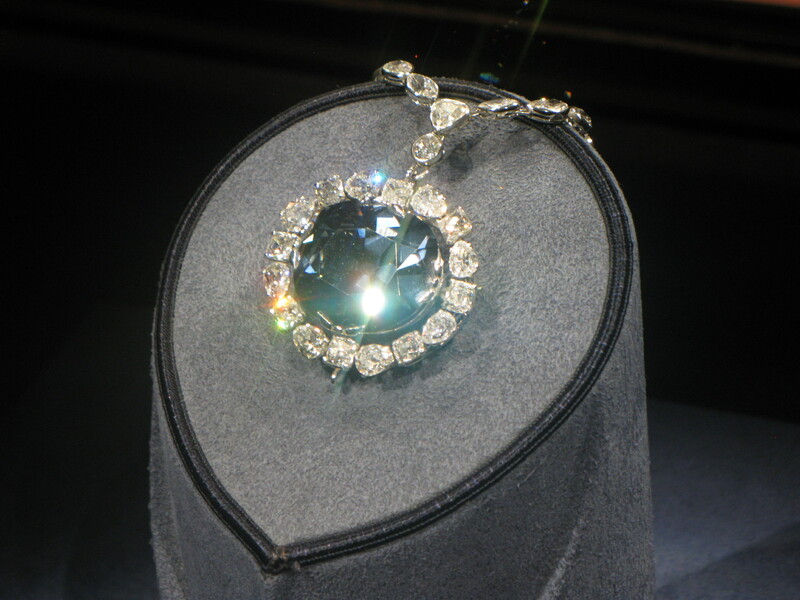 It is believed that the stone was taken to London, and cut into two pieces, the larger piece becoming the Hope Diamond. Although there is no record of ownership in the Royal Archives, the diamond is suspected to have been purchased by King George IV of the United Kingdom, before being acquired by a London banker named Thomas Hope. 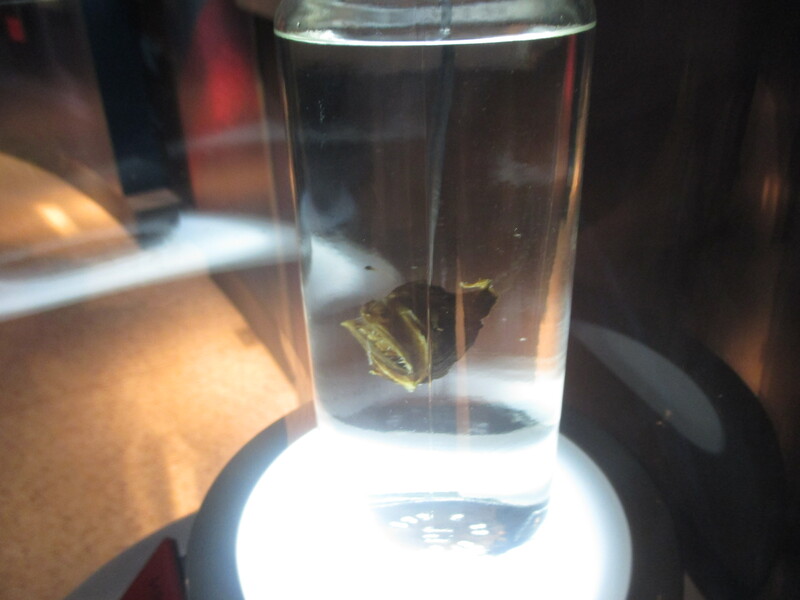 Now known as the Hope Diamond, the stone eventually passed to New York diamond merchant Harry Winston, who donated the diamond to the Smithsonian in 1958, sending it to the museum by US Post wrapped in brown paper. It was insured via registered mail for $145.29; it is now valued at US$200-US$250 million. It’s interesting to hear the number of young girls excitedly squealing “Mommy, diamonds!” The taste for jewellery is clearly already entrenched. My boys are impressed, and upon hearing the value of the diamond, Dominic declares that he’d like to be a miner. I suspect he sees this as a way of cutting out the middle man, when he finds his own Hope Diamond. Their focus on the diamond doesn’t last too long – after one photo, they’re distracted by the size, colours and angles of the extensive crystal collection, ranging from Apophyllite to Zoisite. 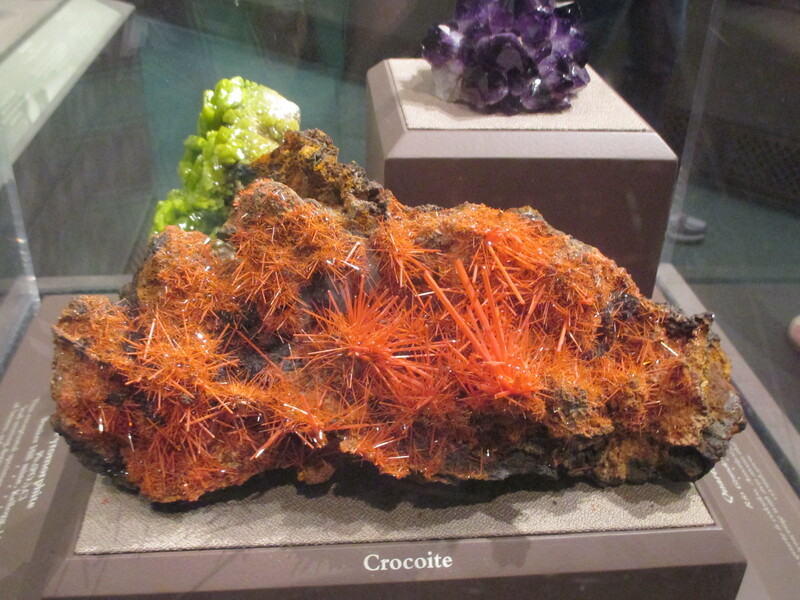 The Geology section is also very comprehensive with many interactive exhibits – the boys touch a piece of Mars, see fossils, search for New Zealand within displays on volcanos and earthquakes around the globe, hear radioactivity emitting from zircon, and try out the magnetic strength of Magnetite. I’m slightly surprised to find that the boys less impressed by the next set of rooms. I had assumed that halls full of whale, shark and manatee skeletons would be a highlight. 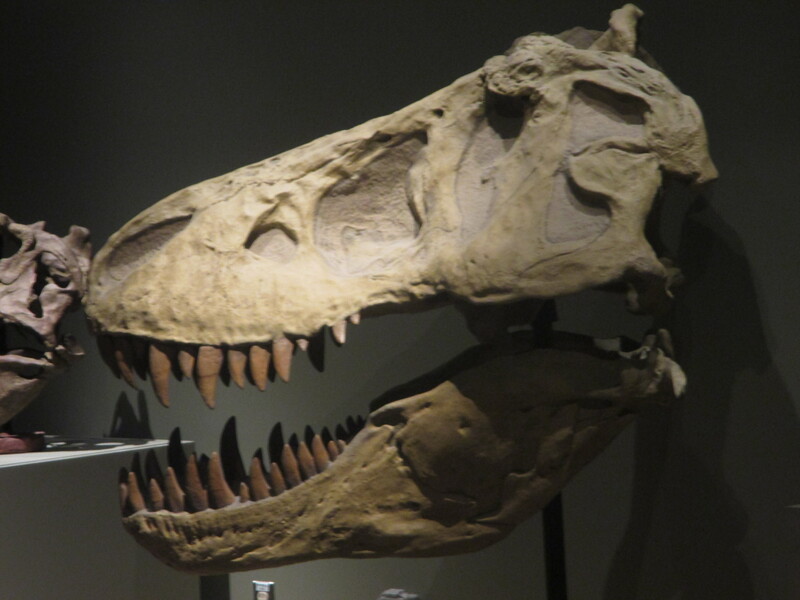 They are more intrigued by the genuine T-Rex skull – part of a display still under construction. Similarly, the Egyptian section, with wrapped and unwrapped mummies, doesn’t get the boys rushing around with cameras snapping. We’re all getting a bit peckish now, but before we find our own meals, we get to watch a more permanent guest of the museum enjoy her lunch. 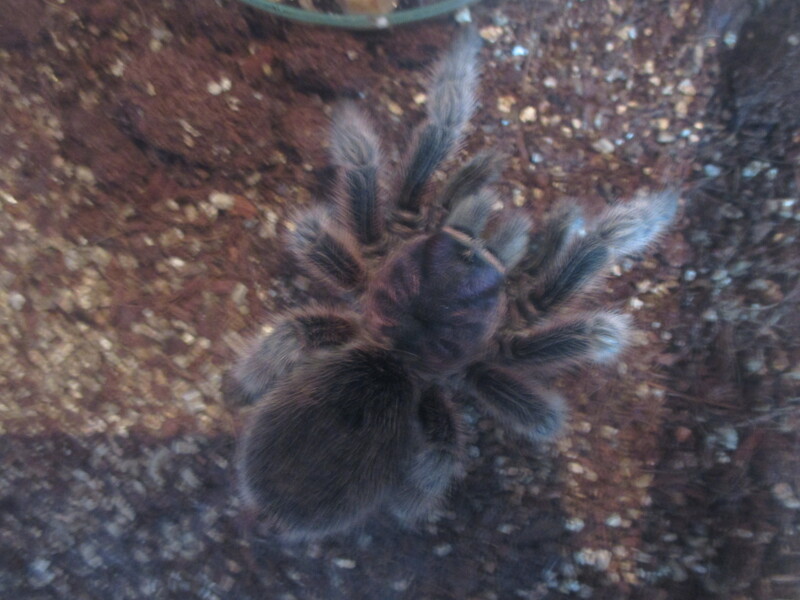 Rosita the Tarantula seemingly never tires of crickets, and the boys enjoy a front row seat. We’re soon justifying another quick, easy and unhealthy lunch, and I introduce the boys to Ghiradelli chocolate. I know this is going to be a winner, and the boys look as happy as a Tarantula chewing a cricket leg. After lunch, Mum decides she wants another look at the Gems, while the boys and I head for the Ocean Hall. We soon see a couple of Giant Squids, one a lot more giant than the other, but both very impressive. 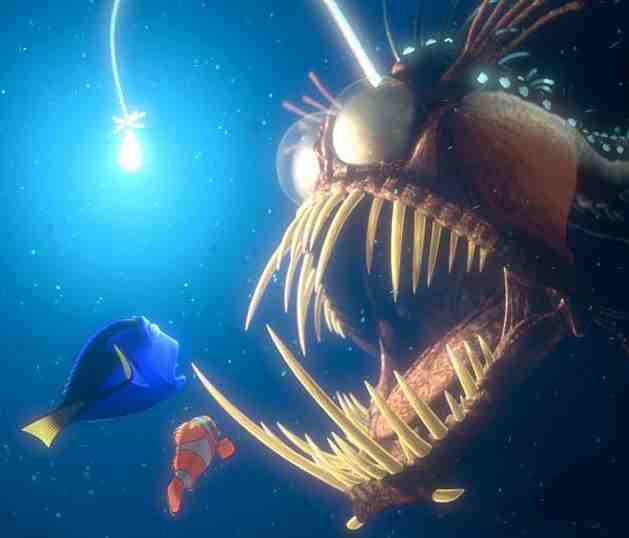 We also see an Angler Fish, which my boys and I all recognize immediately from Finding Nemo. It looks smaller and more friendly in person. But for me, the highlight of this section is the Coelacanth. 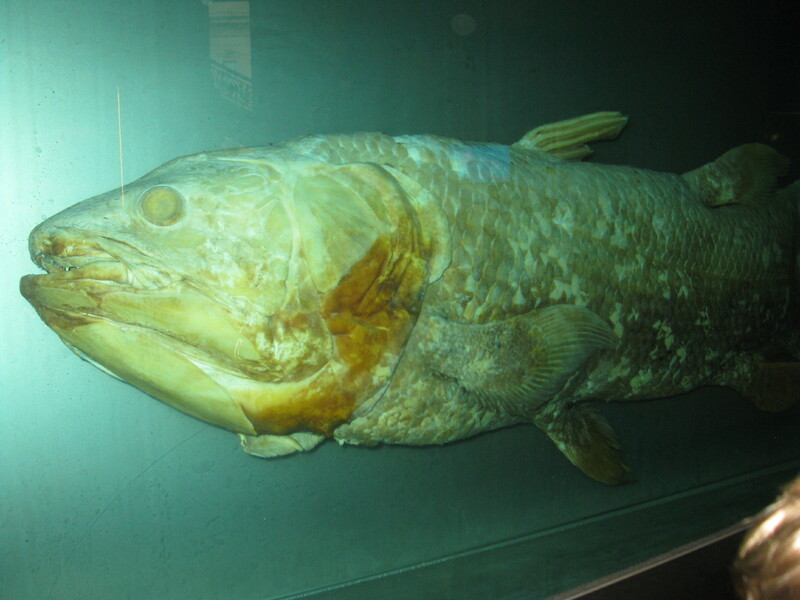 There are only two species of coelacanth, the West Indian Ocean coelacanth and the Indonesian coelacanth, and both are threatened, making this the most endangered order of animals in the world. But it isn’t the rarity that makes this fish special. I remember from my childhood seeing a photo of the coelacanth, and reading how they were thought to have been extinct for 66 million years, until one was caught off the coast of West Africa in 1938. They are still critically endangered, but have been found in the Comoros, Kenya, Tanzania, Mozambique, Madagascar, and South Africa. Fortunately for the coelacanth, they hold no value for fisherman as they reportedly taste terrible, but they are still threatened by commercial deep-sea trawling. This museum really does have something for everyone, and one day goes nowhere near doing it justice. Sadly that’s all we have, but I intend to get back here one day. 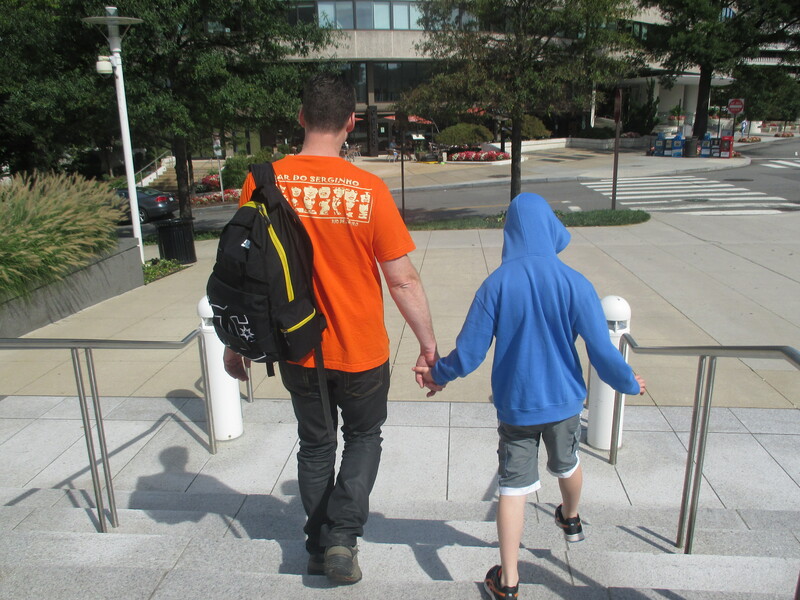 Day Four – Our metro destination this morning is Foggy Bottom. There has to be an interesting story behind that name – and apparently this area by the Potomac River is believed to have been susceptible to concentrations of fog and industrial smoke. 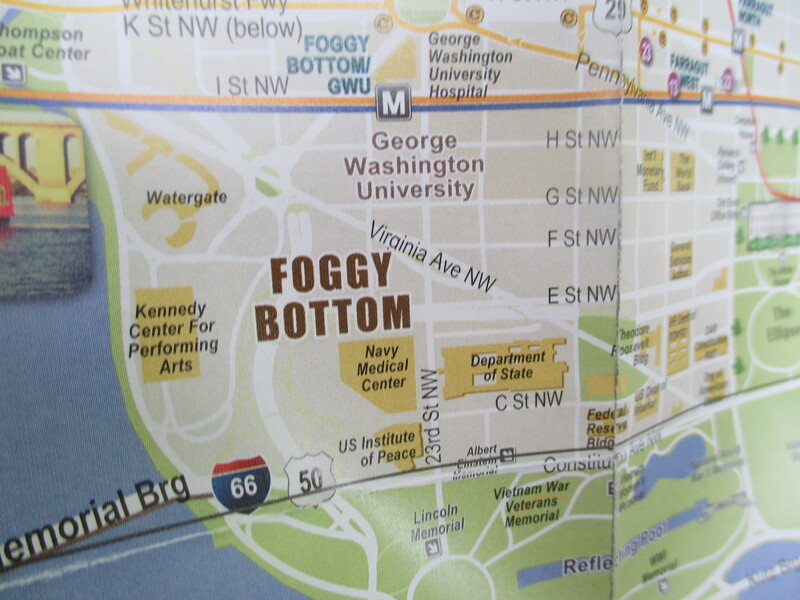 Foggy Bottom is home to many Federal agencies, so surely there a few jokes about the appropriateness of the name. There’s no sign of fog today, as we walk past embassies, George Washington University, and the Kennedy Arts Center, towards the buildings that I want to see – 700 New Hampshire Ave, also known as the Watergate Complex. 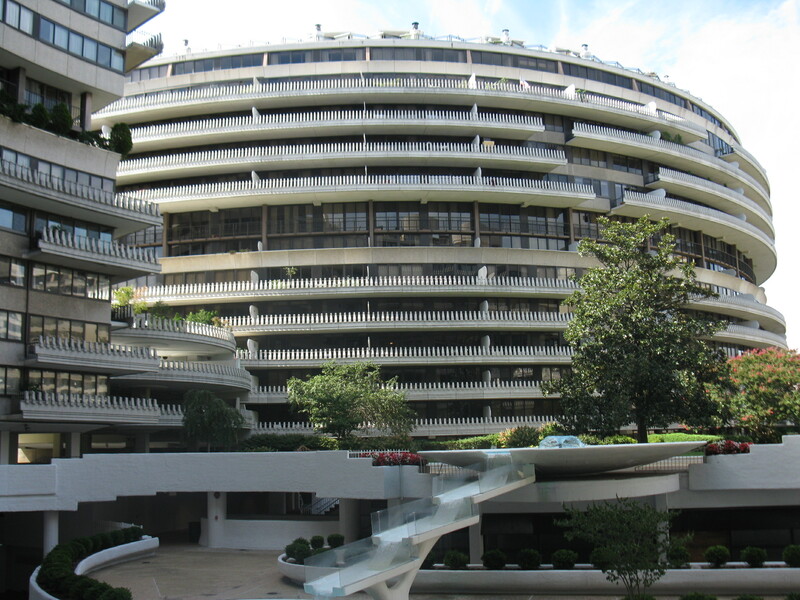 I had only ever heard or read references to the Watergate Hotel, but as well as the Hotel, the Watergate complex also includes contains an office building and three apartment buildings. Built in 1967, the trademark curves were intended to complement the planned Kennedy Arts Center (which later changed its design) and a proposed expressway. It looks exactly as I recall it from news footage following the 1974 scandal that lead to Nixon’s resignation. 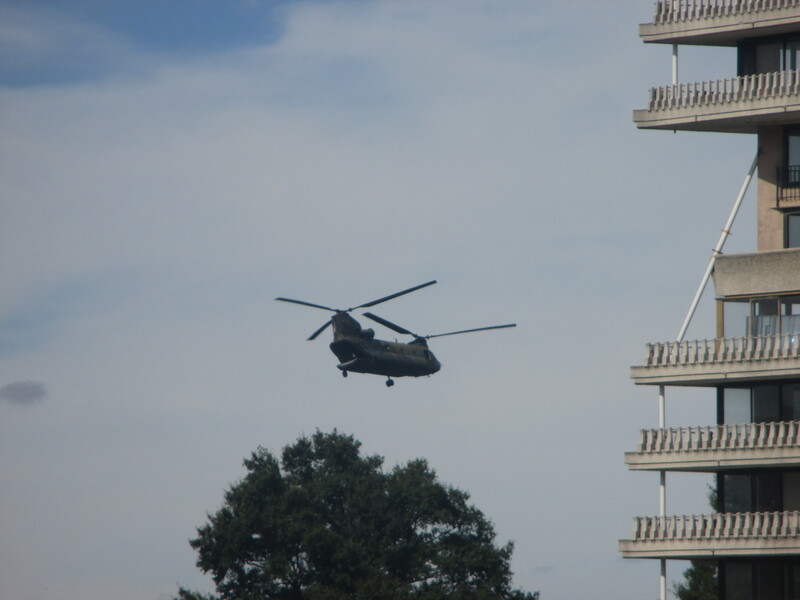 While we’re trying to fit the façade of the building on our cameras, a series of helicopters seem to swoop on the hotel. There’s an open area between the buildings, and they feel so close, it’s almost as if they are flying among the buildings. They soon pass, but for an instant it feel as if something dramatic is about to happen. Is history repeating itself? No it isn’t, and we head off in search of the Lincoln Memorial. 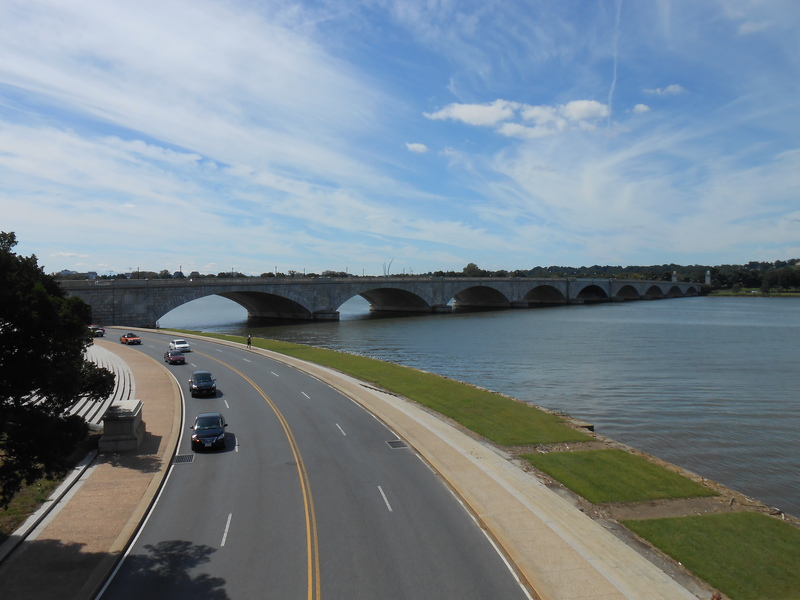 It’s a beautiful day, and joggers and cyclists are constantly competing for the pavement as we wind our way around the Potomac. We can see Georgetown along the river to our right, while planes are constantly taking off from Arlington, now opposite us on the other side of the river. I find out later this is Ronald Reagan airport. 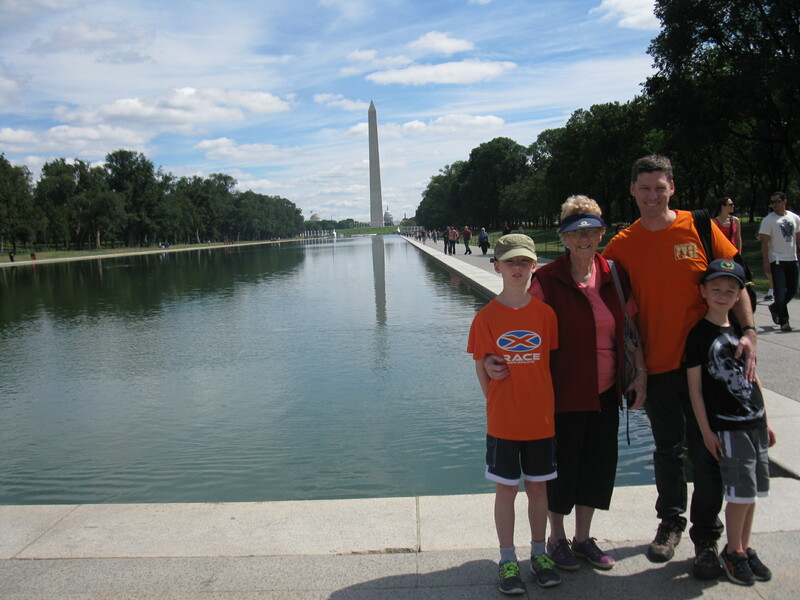 We reach the Lincoln memorial in front of the Reflecting Pool, and the boys get a quick lesson on Lincoln’s place in history. Following Lincoln’s assassination in 1865, proposals for a fitting monument saw a series of rejections, from the initial bill passed by Congress in 1867 until acceptance in 1910. 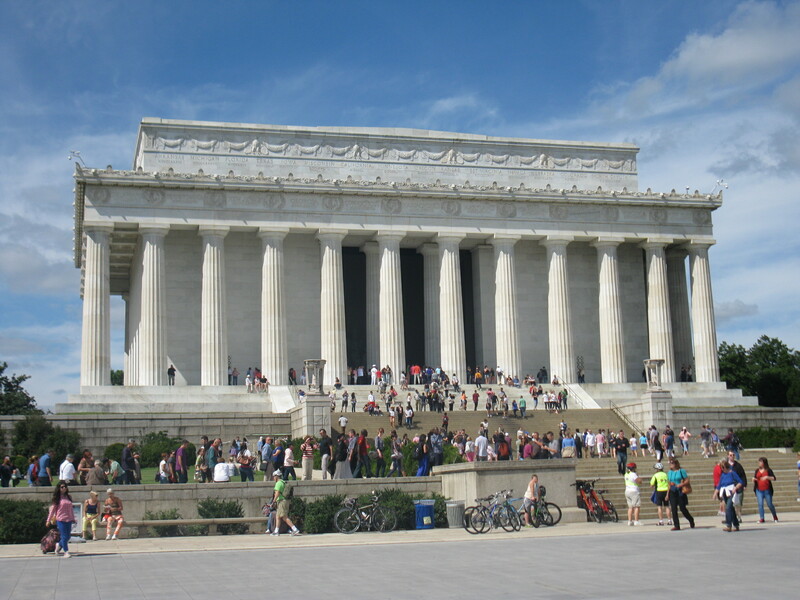 The memorial was opened in 1922, in the presence of Lincoln’s then 79-year old son Robert Lincoln. The site has also become famous for being the location of Martin Luther King’s “I Have A Dream” speech to 250,000 people, as part of the “March on Washington for Jobs and Freedom”, one of the largest rallies for civil rights in US history. A 22-year old Bob Dylan also played that day. 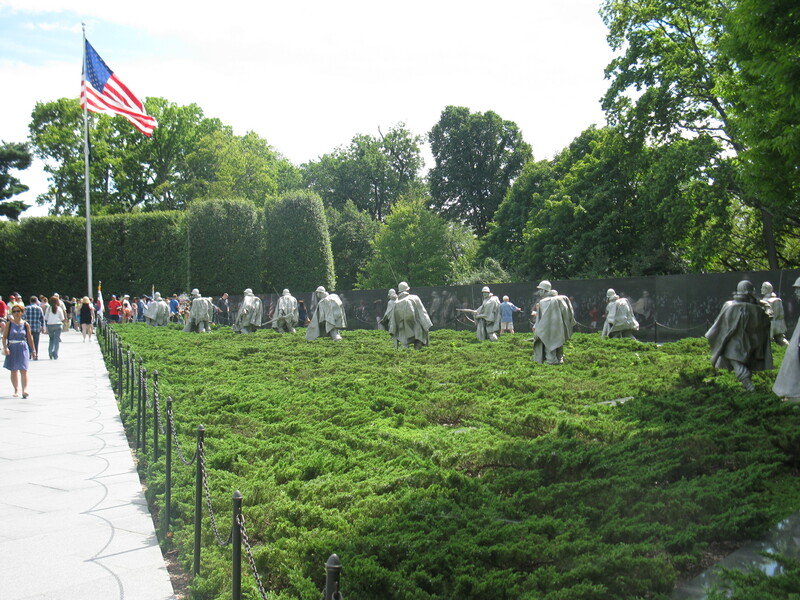 After unintentionally sharing our lunch with squirrels, we move on via the impressive Korean War Memorial to the Roosevelt Memorial. This is quite a contrast, and seem a tad underwhelming. I can’t help but wonder who is responsible for these memorials. 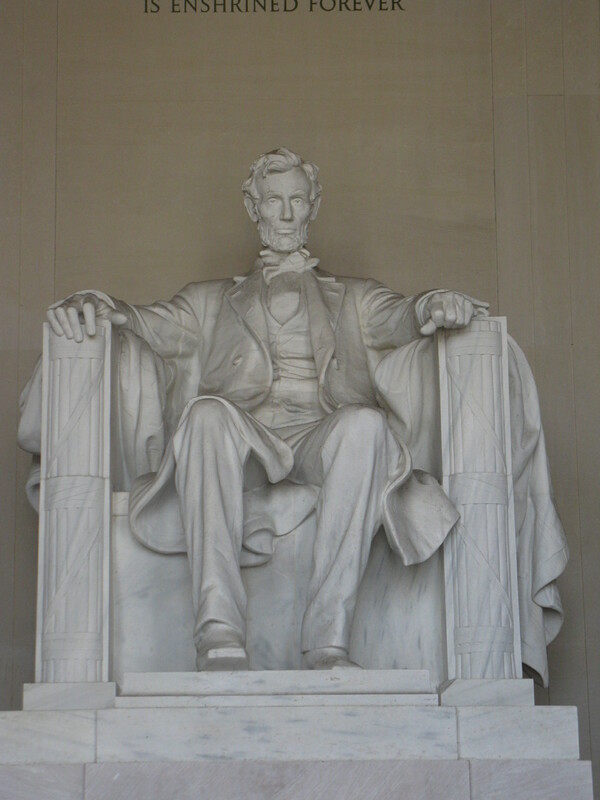 If a memorial is proposed during the term of a President from an opposition party, how would that impact the grandeur of the monument? Maybe it’s more a question of how tight the coffers are. 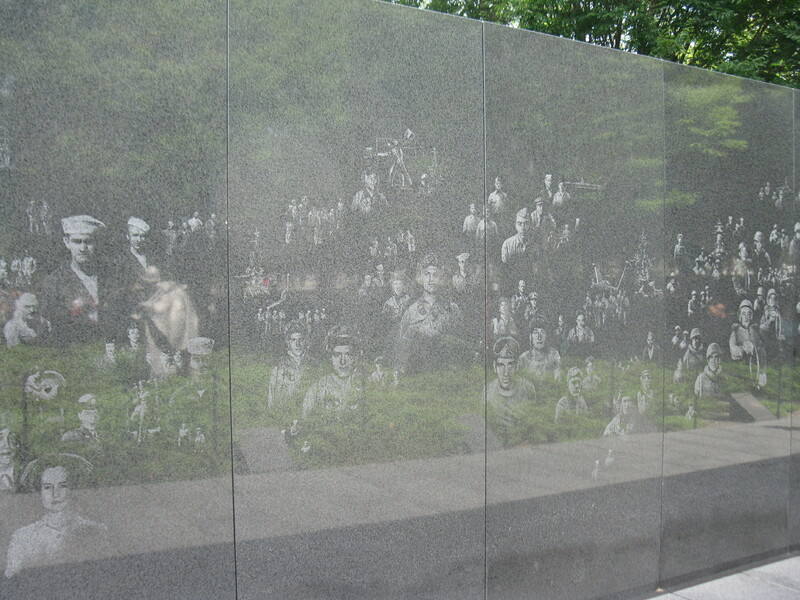 The design competition for the Roosevelt memorial was won in 1974 by Lawrence Halpin, but for over two decades Congress failed to find the funds. Halpin’s design was finally opened by President Clinton in 1997. 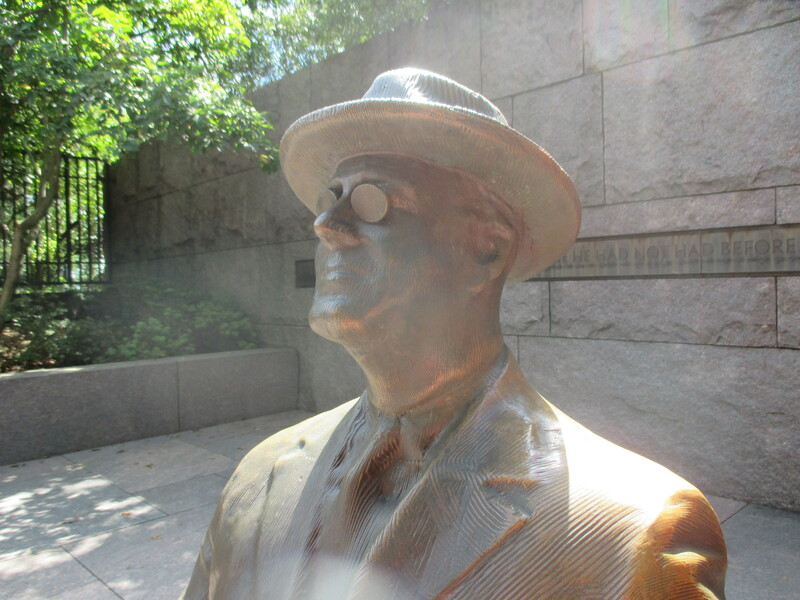 Criticism had been voiced about Roosevelt’s depiction in a wheelchair, with concerns that Roosevelt was being made a hero because of his disability. The memorial also includes braille for blind visitors, but unhelpfully mounted eight feet above the ground. We unfortunately miss the path to the Martin Luther King memorial, only spotting it across the Tidal Basin when we reach the Jefferson Memorial. They definitely knew how to build monuments in those days. Jefferson was clearly a busy man – the principal author of the Declaration of Independence, and the 3rd US President, he also found time to double the size of the United States, be fluent in French, Greek, Italian, Latin and Spanish, and following the death of his wife, he appears to have fathered six children with his slave, Sally Hemmings. As with the other Memorials, this too had its detractors. 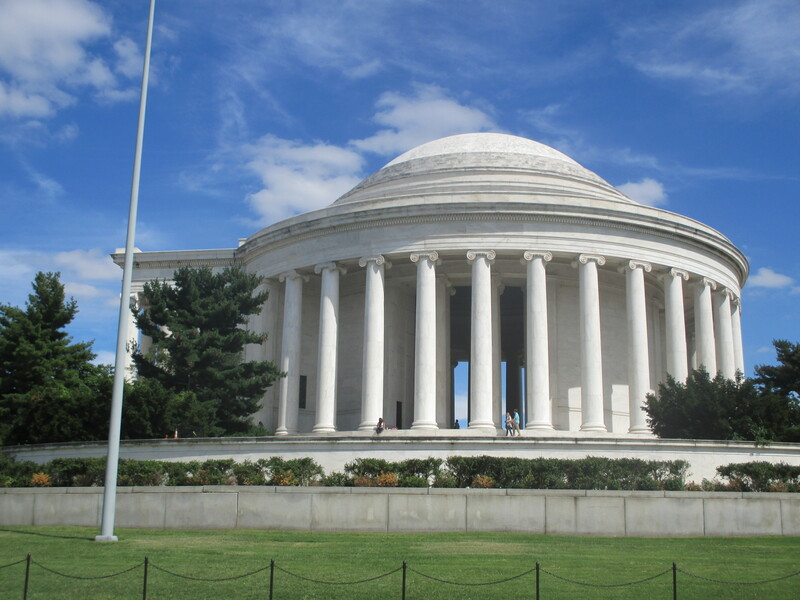 In 1925 the site was initially proposed as a Memorial to Theodore Roosevelt but Congress did not fund this. 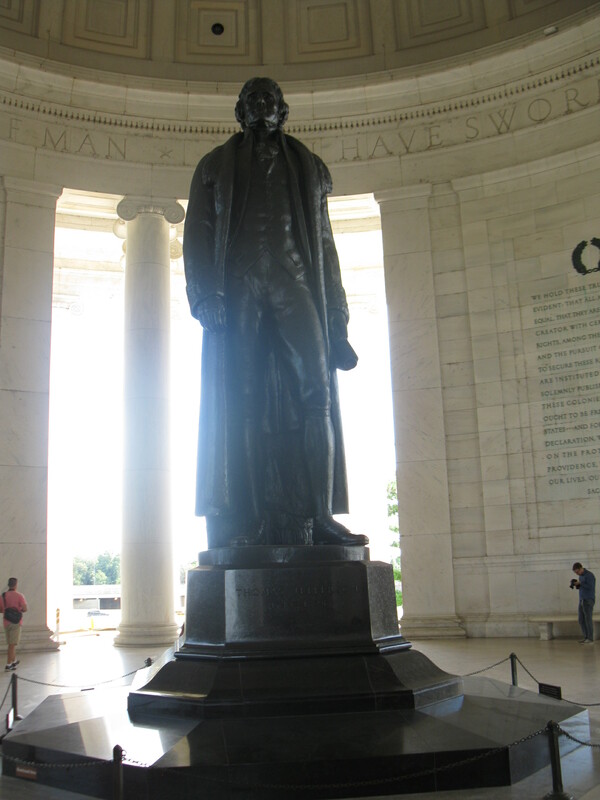 President Franklin Roosevelt was a fan of Jefferson, so proposed a memorial to him, with more success. The building was opened in 1943, but due to wartime shortages in bronze, the statue could not be completed until 1947. It’s been a long, hot and tiring day, and our feet need a rest. Despite all that, the boys are enjoying themselves, and seem to be taking in the significance of these grand buildings and their imposing statues. Washington is living up to all my expectations. 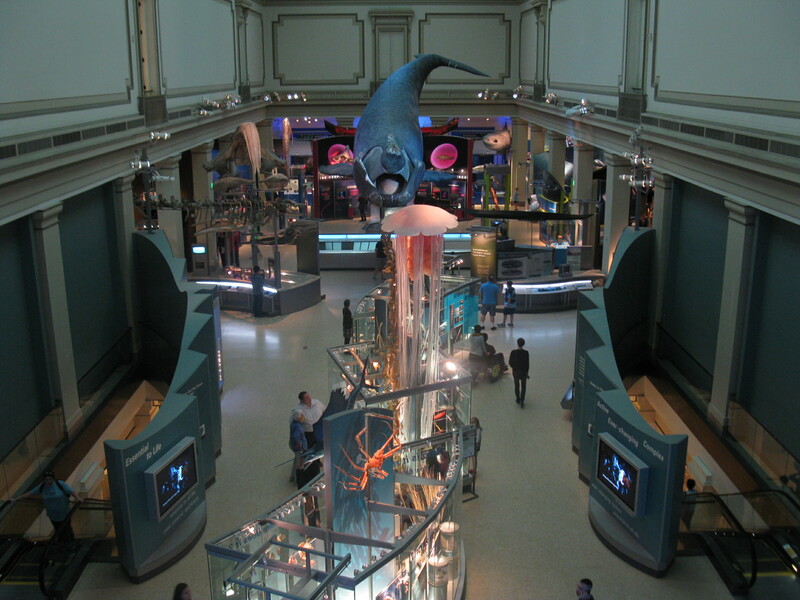 Tomorrow – the National Air and Space Museum awaits. 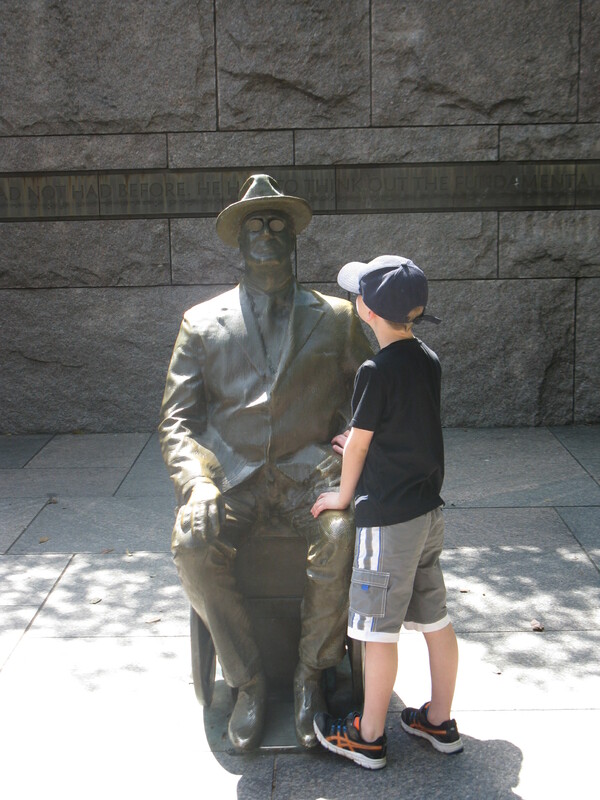 This entry was posted in Travel and tagged ammonite, angler fish, Coelacanth, Foggy Bottom, fossils, gems, hope diamond, Jefferson Memorial, Korean War Memorial, Lincoln Memorial, minerals, nemo, Roosevelt Memorial, tarantula, Washington DC, Watergate. Bookmark the permalink. I’m enjoying your Washington posts. 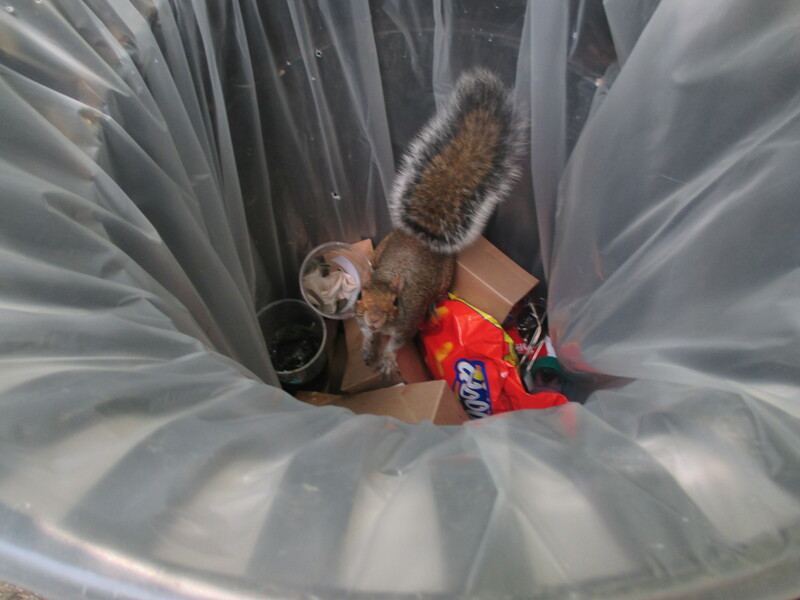 Our last visit there coincided with all that federal government shutdown palava, so a few things had to be left unseen! Highly inconvenient. Hi Hayley, thanks for reading! That’s a shame about all the shutdowns. I remember all that happening – must have been very frustrating. Hopefully you still had a good time. Maybe you can fill in the gaps on a stopover sometime?